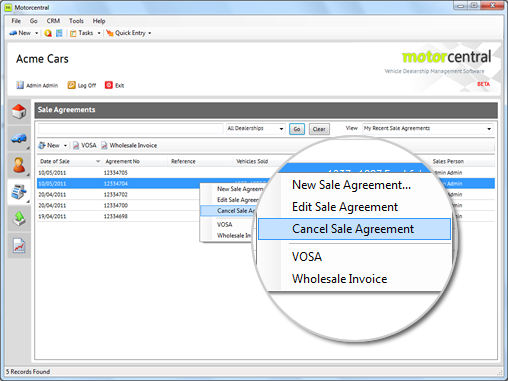 Select the Sale Agreement tab from the Navigation Menu and identify the sale you wish to cancel in the workspace area. You can use the search function to find the appropriate sale if it is not already listed. Once you have identified the correct sale, simply right-click on it and select Cancel Sale Agreement. You will be asked to confirm you wish to cancel the sale. Select Yes to proceed. If the Cancel Sale Agreement option is disabled (grayed out) you do not have the correct security rights to use this feature. Please contact your System Administrator to enable the feature.